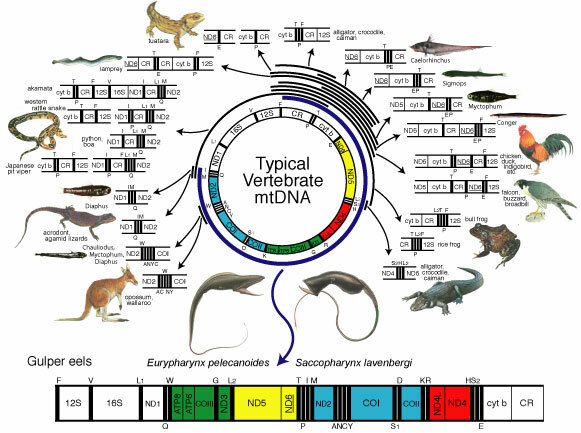 Recent studies have demonstrated that deviations from the typical vertebrate mitochondrial gene order are more frequent than initially thought. Such deviations, however, are minor, with inversions and/or translocations of a few genes being involved and tandem duplication of the gene regions followed by deletions of genes having been invoked as mechanisms originating in such novel gene order. 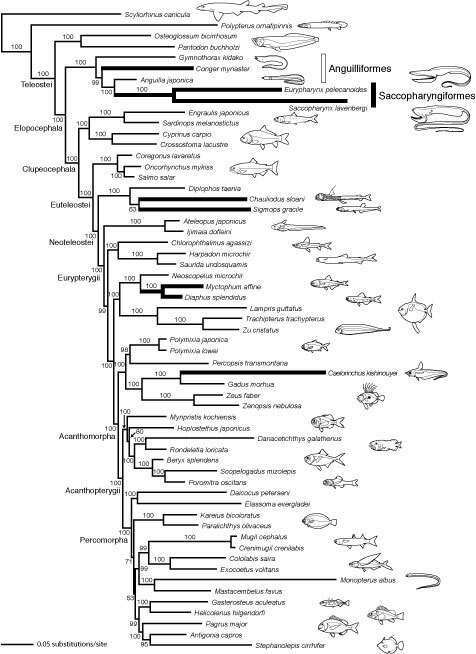 During the course of molecular phylogenetic studies on the Elopomorpha (eels and their allies), we found that mitochondrial genomes (mitogenomes) from the two deep-sea gulper eels, Eurypharynx pelecanoides (Eurypharyngidae) and Saccopharynx lavenbergi (Saccopharyngidae), exhibit an identical gene order which greatly differs from that of any other vertebrates. 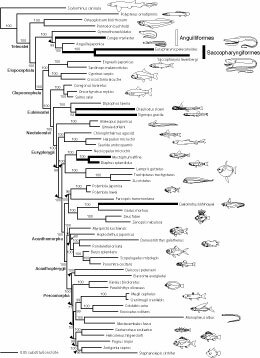 Phylogenetic analysis using the mitogenomic data from 59 species of fish not only confirmed a single origin of such a gene order with confidence but also indicated that it had been derived from the typical vertebrate gene order. Detailed comparisons of the gulper eel gene order with that of typical vertebrates suggested that occurrence of a single step, large-scale duplication of gene region extending12 kb, followed by deletions of genes in a common ancestor of the two species, most parsimoniously accounts for this unusual gene arrangement. Inoue, J. G., Miya, M., Tsukamoto, K., Nishida, M. 2003. 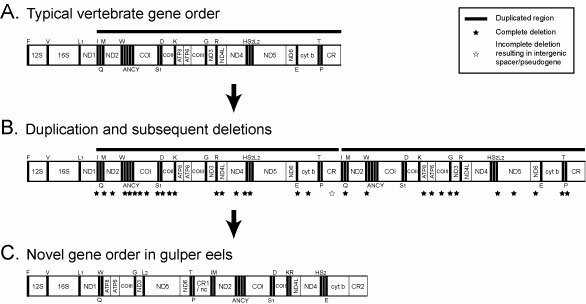 Evolution of the deep-sea gulper eel mitochondrial genomes: large-scale gene rearrangements originated within the eels. Molecular Biology and Evolution 20,1917-1924.